I really liked Timothy Ruff‘s recent post: 7 Myths of Self-Sovereign Identity. I recently attended the ID2020 event in New York, where some of the biggest players in identity were on hand, working toward fulfilling the United Nations’ Sustainable Development Goal 16.9: Identity for all by 2030. It was an excellent event, lots of energy, very professional, and serious about moving the needle on this BHAG (big, hairy, audacious goal). We heard first-hand examples of the pains caused by broken identity systems around the world, some of which were truly heartbreaking. Most of us take for granted that we can prove things about ourselves, unaware that over a billion people cannot, leaving them unable to obtain desirable work or advanced education, open a bank account, hold title to property, or even travel. As noted by the World Bank’s ID4D, identity is a prerequisite to financial inclusion, and financial inclusion is a big part of solving poverty. That means improving identity will reduce poverty, not to mention what it could do for human trafficking. Refugees bring another troubling identity dilemma where the need is critical, and where we are commencing efforts through our partnership with iRespond. Several times throughout the event, Self-Sovereign Identity (SSI) was discussed as a new and potentially big part of the solution. While there was clearly hope, there was also skepticism that, in my opinion, stems from misperceptions about what SSI really is and is not. If SSI really was what these skeptics thought, I wouldn’t favor it either. And if they knew what SSI really is, I think they’d embrace it wholeheartedly. Kim went on to clarify that he is strongly in favor of SSI, he just dislikes the term and the negative perceptions it conjures up. Self-sovereign identity is not a great term — for lots of reasons — but until we have a better one, (“decentralized identity” is a serious candidate) let’s clarify the one we’ve got. SSI attempts to reduce government’s power over an identity owner. SSI creates a national or “universal ID” credential. SSI gives absolute control over identity. There’s a “main” issuer of credentials. There’s a built-in method of authenticating. User-centric identity is the same as SSI. All the points Timothy makes (except his definition of user-centric identity – my views were explained here in 2008 in – er – ‘terse prose’, rather like espresso) should help convince people who understand identity that SSI is worth looking at. But the first point stands out as a basic stake in the ground. Decentralized identity systems must allow us to present claims we make about ourselves (now called self-attested), but must allow us to present claims that express things others say about us too. Governments offer an excellent example. Governments make laws. For those of us in contact with civilization our legal identities are key to important aspects of our lives – like signing contracts or crossing borders. So our identity systems must allow us to present legal, verifiable, government-backed claims whenever it is appropriate and we agree to do so. Writing this, I get a strange déjà-vue pointing out that “Just because some tables are green, it doesn’t mean that all tables are green.” Must we really argue that just because some claims should be self-issued, that doesn’t mean all claims should be self-issued? The principle is self-evident. But I’ll be posting at length about the ways we can combine user-control, self-issued claims and verified claims to create the next big mainstream identity technology. Meanwhile let’s explain to our colleagues who don’t have the opportunity to interact with real customers that “Self-Sovereign Identity” has been test-marketed and bombed. Let’s start brain-storming a really good name for the true social network that is controlled by its users and allows us to present claims from whoever we want. In my last keynote for the European Identity Conference I described how the Laws of Identity, that were increasingly flaunted by the Internet giants during the decade following their articulation, culminated in sharp and rigorous pushback by the European Union in the form of the GDPR – just as the Laws had predicted would happen. In a word, the GDPR turned laws of computer science into legal constructs. I also explained how crucially important this was: that GDPR would press the digital reset button not just on Europe, but on the entire world. 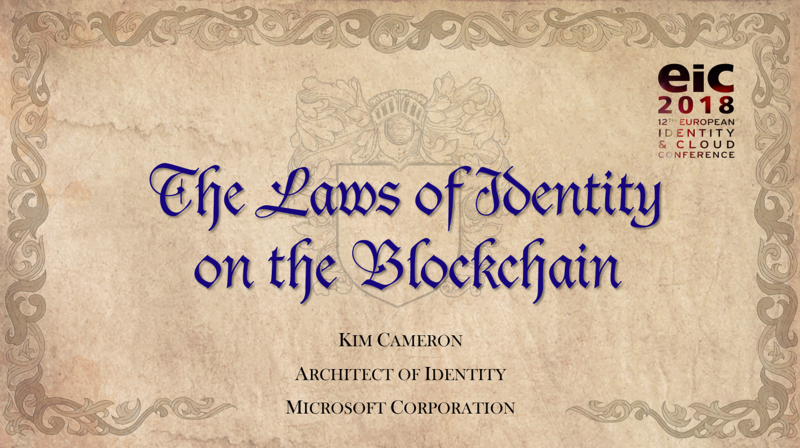 I argued it would usher in a whole new “user-in-control” era of technology, one symptom of which would be the rise of the decentralized identity initiative leveraging blockchain. Since then one recurring question people have had is why I thought the GDPR regulation, which only applies in Europe, would have a broad international impact, since “things are so different in the US”. First, the same issues that led the European Union to create the GDPR impact all societies. There are countless people in America and elsewhere who have lost all confidence in the Internet giants to protect their data or their interests. This has already given rise to social sentiment that is motivating political leaders to get on the right side of history – introducing data privacy legislation. And in the discussion around what this will be, the GDPR has set the bar and established expectations that make it easy to lead campaigns describing what bad legislation is missing. Second, all sentient beings within the internet companies understand the fundamental nature of the internet: it is world-wide and cannot be bifurcated. Building reliable, defensible services that behave differently in Europe and North America is a no-win proposition. Technology companies have lobbied for international harmonization of regulations for many years. Over time practicality will push those who choose to bifurcate and ignore the internet’s fundamental nature back to this principle. Microsoft, which operates a number of giant internet services, saw from the beginning that the GDPR was consistent with humanistic aspirations and that formalizing protections in the ways specified by the GDPR was simply a best practice that should apply to every service we operate everywhere. Satya Nadella has consistently supported not only the GDPR, but the citizen’s right to identity and privacy, and beyond that, the whole principle of user-centric computing and giving people control of and access to their data. But those with doubts about the world-wide impact of GDPR can now also read carefully the truly remarkable speech given Wednesday by Apple’s Tim Cook. He makes it absolutely clear that Apple sees the GDPR as a fundamental technology building-block and fully understands that the EU has effectively pushed the digital reset button world-wide – and that this is hugely positive. That this speech represents a really commendable watershed moment is best demonstrated by its low point: Tim’s “embellishment” of Apple’s stance towards privacy back in 2010. · We may collect information such as occupation, language, zip code, area code, unique device identifier, location, and the time zone where an Apple product is used so that we can better understand customer behavior and improve our products, services, and advertising. Apple’s new policy is also under fire from two Congressmen who gave Apple until July 12th to respond. Reps. Edward J. Markey (D-Mass.) and Joe Barton (R-Texas) sent a letter to Apple CEO Steve Jobs asking for answers about Apple gathering location information on its customers. For the record, the only error in the CSO article is that I actually took Microsoft to task for having broken the Laws of Identity while I worked at Microsoft. And the main reason I stayed at Microsoft is because they listened. By the way, I’ve never admitted this before, but I was so peaved by Apple’s assertion that they could release my identifier and location to anyone they wanted, that I took my iPhone, which until then I had liked, put it on my driveway, and squished it into aluminum foil by driving over it several times. In light of Tim Cook’s terrific speech, I think I will probably get one again. Thanks, Tim, for pressing that reset button. Like the other attendees, I very much enjoyed the Kuppinger Cole European Identity and Cloud Conference (EIC) 2016 held in Munich in May. The conference is growing by leaps and bounds but still provides plenty of opportunity for interaction and exchange of information. Run by Europeans for Europeans, it provides great insights for those of us from outside the EU and gives us a better understanding of the hot-topics in the European IT community. Again I’ll just share tweets hoping it will give a feel for what transpired. My slightly personal keynote on The Cloud is Rewiring the World – What does it Mean for Identity and my presentation The Future of AD in the Days of Azure AD are posted courtesy of Kuppinger Cole. Note: Originally a “storify” recapitulation of twitter traffic appeared here, but “storify” disappeared and nuked everyone’s content on May 16th 2018. If you haven’t attended, the IIW is the perfect “un-conference. It has no keynotes or panels, it’s about getting stuff done.” Besides that, everyone doing anything leading edge in digital identity attends as often as they can – it’s a place to collaborate and a Who’s Who of experts. Why keynote them? But Phil explained there were many attending the conference who were new to Identity and didn’t have any context or way to grasp what people working in the area had already been through. So he asked me to talk about “The Laws of Identity 10 years later”. The “later” was intriguing. It gave me the opportunity to share what we had learned 10 years ago, and then begin to discuss what we have learned since. I’ve been wanting the chance to get a conversation going about that, so I agreed to take the risk of breaking the no-keynote taboo. As the day of the conference approached, I saw there was no mention of a keynote in the conference materials, and began to dread being booed out of Mountain View for doing a keynote in a sacred place… Anyway I forsook slides (what a liberating experience!) and just jotted down a few notes in case the keynote (an un-keynote?) actually took place. Which it did – and those in the audience were more than gracious. It led to great conversations with people approaching identity in new ways, including conversations about one of my big new interests: blockchain. Whew! That’s a real punishment for neglecting a blog! Or, perhaps worse, a bit extreme as a reaction to seeing me pick up the pen again. Boy! It sure shows it’s better to check your understanding of what people are saying before drawing any conclusions! 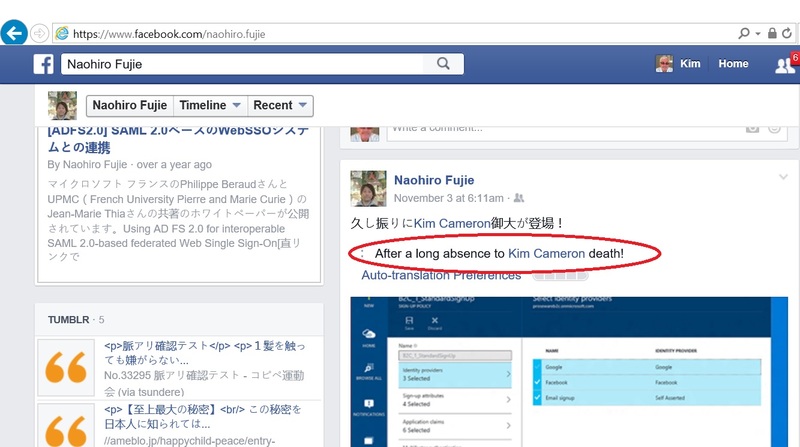 Meanwhile, I give Facebook’s Japanese translation engine a double *fail*. Please, Facebook! Take off that Translate button! And nice to meet you Naohiro. 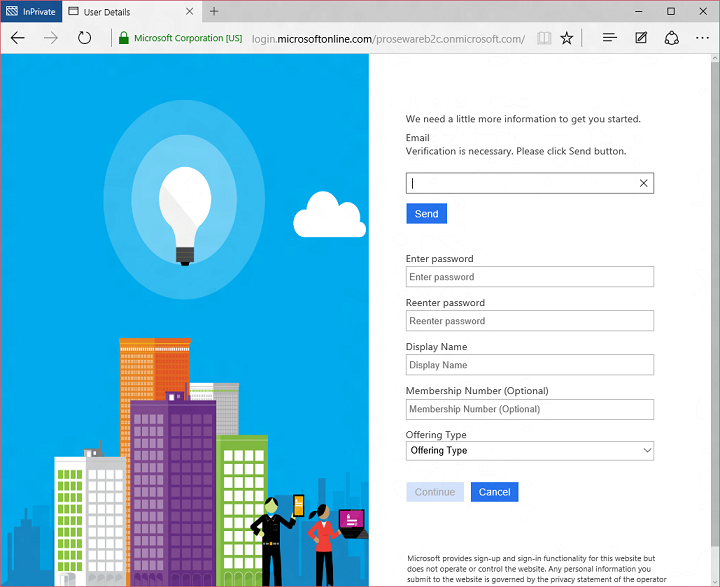 Last month Stuart Kwan wrote a great intro to our new Azure Active Directory B2C service and showed people how to start using it. As he explained, “Once you have a B2C tenant, you register applications and configure policies which drive the behavior of sign in, sign up, and other user experiences. 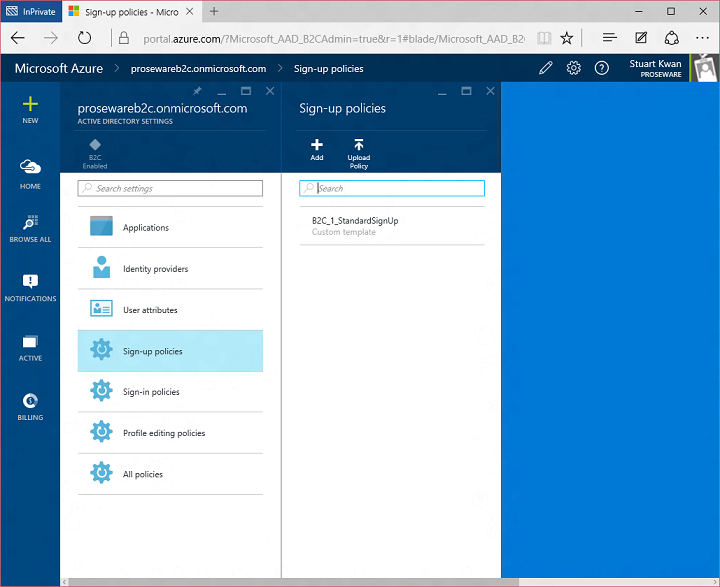 Policies are the secret sauce of Azure AD B2C.” He gave step-by-step instructions and showed examples like this one of using the B2C Admin Portal to configure a policy based on social network providers: Today I’d like to build on Stuart’s introduction by explaining why we saw a customizable, policy-based approach to B2C as being essential – and what it means for the rest of our identity architecture. This will help you understand how our B2C Basic offering, now in public preview, actually works. It will also provide insight into the capabilities of our upcoming B2C Premium offering, currently in private preview with Marquee customers. I think it will become evident that the combination of our Basic and Premium products will represent a substantial step forward for the industry. It means organizations of any size can handle all their different customer relationships, grow without limitation, gain exceptional control of user experience and still dramatically reduce risk, cost, and complexity. Readers of this blog probably already know quite a bit about enterprise identity management. So let me begin with what I think is the most important piece of information I can convey to people who are already expert: B2C does not just involve a couple of tweaks on the identity management we have learned to do for employees and devices. The underlying technical infrastructure, the developer model, the protocols and information storage concepts, continue to apply. But whole new technical capabilities are also required that make B2C, well… different. To fully understand what’s at play we need to ask, “What are the differences between the way businesses interact digitally with their customers and the way they interact with their employees?” This isn’t the place to explore this – I’ll do so on Online cheap prednisone. For now I’ll sketch the big picture as I see it. Organizations and their employees typically have a close and ongoing relationship. Employers “know” their employees, having verified their qualifications and made them part of an enterprise team. They assign them a “corporate identity” – an account and password (and potentially a smartcard or OTP device) through which they identify themselves to corporate systems. To maximize productivity, employees typically log in once and work using their corporate identity for long periods of time. Internal identity systems have not generally been context-aware: the context has simply been that the employee is at work, doing his or her job. Meanwhile organizations have had a completely different approach towards their customers. Relationships with customers have been driven by sales and marketing departments, not by traditional IT departments. The goal has been to eliminate friction (and clicks!) so new customers come on board – even before the enterprise knows the slightest thing about them – and then deepen the relationship and get to know the customer based on his or her specific needs and behaviors. Succeeding at this results in retention of the customer over time. Marketers in a number of industries actually see the ultimate role of customer identity being to learn how to delight their customer. Clearly there are also cases where customers need access to their own valuable possessions and information, for example, in financial, health, insurance and government scenarios. Here customers will be willing to jump through various hoops to prove their entitlement and protect what is theirs. But far from being an exception, such high value scenarios drive home the fact that interacting with customers is all about being able to match the customer experience and related identity interaction to the specific activity a customer is engaged in rather than imposing some inflexible one-size-fits-all approach on everything. The essential is that B2C scenarios demand, above all else, the ability to customize the customer’s identity experience to what is right for whatever they are doing. The requirement for continuous customization led us to create a technology enabling organizations to create “policies” that allow complete control over identity behaviors and experiences, and use these to drive the behavior of a flexible “identity experience engine” that handles all the issues around security, information protection, protocols, support for mobile and web devices and applications, and scalability. Any application developer, department, enterprise, or group of enterprises can create policies. Then applications and portals can, depending on their context, invoke the identity experience engine passing the name of a policy and get precisely the behavior and information exchange they want without any muss, fuss or risk. These policies are what Stuart Kwan called “the secret sauce of Azure AD B2C”. What behaviors of the identity experience engine do the policies control? The idea of user journeys is key to the customization of customer experience and sheds light on how the system works at the protocol level. The identity experience engine operates as a pipeline and uses request/response claims exchanges to communicate with its internal components as well as with external entities. The diagram below shows the example of a browser application or mobile application redirecting to the identity experience engine while specifying a policy that invokes a user journey. This particular journey begins with an identity selection experience – completely customized by the policy to blend into the rest of the application or portal. The customer then chooses whether to log in with an email-based “application-specific account” or with a social network. Because the journey is intended to control access to a high value resource, the customer’s phone numbers are retrieved from the customer directory and she is asked to up-level her authentication using an SMS or phone call. Then a token is issued for the application providing a number of claims retrieved from the store. Of course the policy author could have created any other journey appropriate for a given use case. There is no requirement to use MFA, consult a store, use social providers or anything else: all is flexible and extensible. 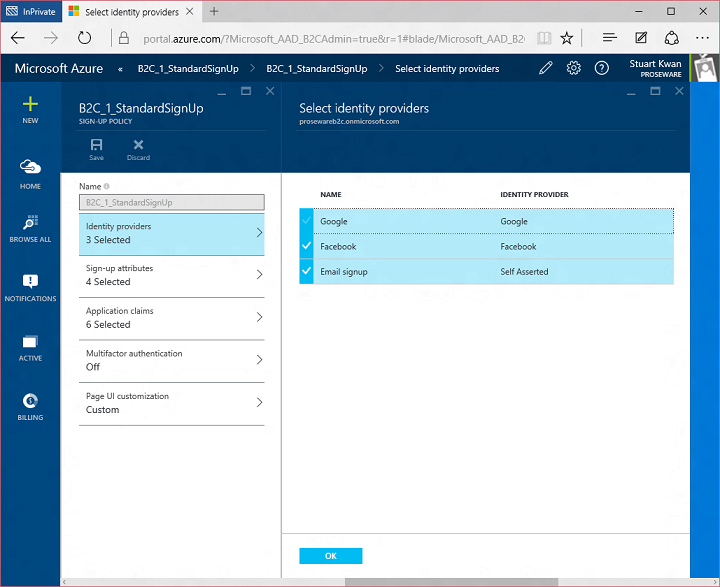 It is important to understand that the identity experience engine used in B2C is an intrinsic part of Azure Active Directory, not some new service. The policy-based approach applies to many AAD scenarios besides B2C. All enterprise computing can benefit from policy-based identity and you likely already recognize that AAD Premium’s Conditional Access introduces these capabilities into B2E scenarios. It is our goal to make AAD B2C identity management available to every organization regardless of size or complexity. We’ve been working with a host of companies in preview to make sure our B2C Basic offering solves the customer identity challenges of a wide cross section of companies solving straightforward issues. B2C Basic uses all the same technology as will B2C Premium. The difference is that the Basic policies are 100% written by our B2C Basic Admin Portal. As Stuart explained, to author policy, you pick all the options you need to integrate a growing number of social providers and/or a customizable identity provider uniquely for your tenant. You can extend schema and select multi-factor authentication, do email verification and much more. You choose what information is released to which application. As you maneuver through the portal it writes your policy. B2C Premium will be a superset of B2C Basic in which you will be able to take advantage of all the other capabilities of the system that are not present in the Basic portal. Premium is not yet in public preview. But I invite you to follow a set of posts I will be beginning soon on Online cheap prednisone to tell you all about it and show examples of how it works. I hope to hear from you there. Meanwhile, please take a good look at B2C Basic in light of the whole world of capabilities AAD B2C Premium is opening up. For the last several years I’ve been working on a new technology and capability that we are calling “Azure Active Directory B2C.” I’m delighted that I’m finally able to tell you about it, and share the ideas behind it. For me it is the next step in the journey to give individual consumers, enterprises and governments the identity systems they need in this period of continuously more digital interaction and increasing threats to our security and privacy. I don’t normally put official Microsoft content on these pages, but given how important the B2C initiative is, how closely I’ve been involved, and how well it has been received, I think it makes sense to show you Microsoft’s announcement about “B2C Basic”. It appeared on the Azure Active Directory Blog. Stuart Kwan does a great job of introducing you to the product. I hope you’ll take a look at his introduction. I’ll be posting a number of pieces which expand on it – exploring issues we faced, giving you the background on the thinking behind the architecture and implementation, and telling you about the “B2C Premium” offering that is coming soon. I think the combination of Basic’s accessibility and Premium’s feature completeness really offers a new paradigm and amazing opportunities for everyone. 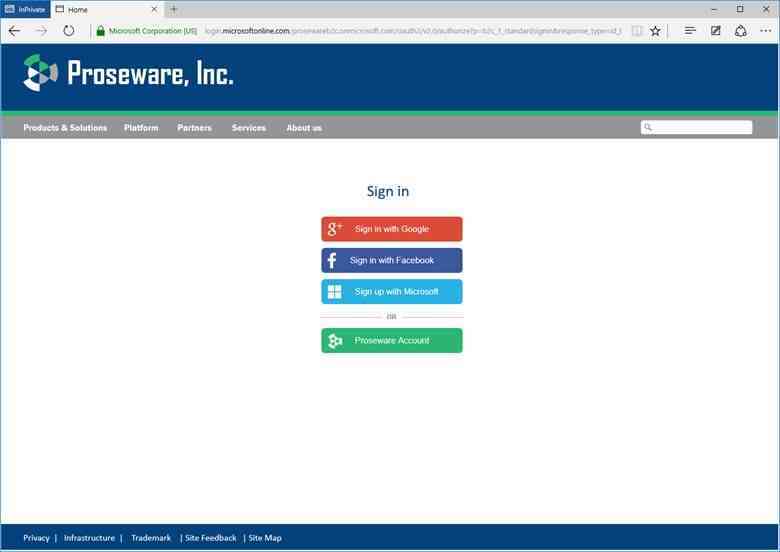 Essential identity management for web, PC, and mobile apps: Support sign in to your application using popular social networks like Facebook or Google, or create accounts with usernames and passwords specifically for your application. Self-service password management and profile management are provided out of the box. Phone-based multi-factor authentication enables an extra measure of protection. Highly customizable and under your control: Sign up and sign in experiences are in the critical path of the most important activities in your applications. B2C gives you a high degree of control over the look and feel of these experiences, while at the same time reducing the attack surface area of your application – you never have to handle a user’s password. Microsoft is completely under the covers and not visible to your end users. Your user data belongs to you, not Microsoft, and is under your control. Proven scalability and availability: Whether you have hundreds of users or hundreds of millions of users, B2C is designed to handle your load, anywhere in the world. Azure AD is deployed in more than two dozen datacenters, and services hundreds of millions of users with billions of authentications per day. Our engineers monitor the service 24/7. Unique user protection features: Microsoft invests deeply in protection technology for our users. We have teams of domain experts that track the threat landscape. We’re constantly monitoring sign up and sign in activity to identify attacks and adapt our protection mechanisms. With B2C we’ll apply these anomaly, anti-fraud, and account compromise detection systems to your users. Pay as you go: Azure Active Directory is a global service benefiting from tremendous economies of scale, allowing us to pass these savings along to you. We offer the B2C service on a consumption basis – you only pay for the resources that you use. Developers can take advantage of the free tier of the service when building their application. B2C uses the same familiar programming model of Azure Active Directory. You can quickly and easily connect your application to B2C using industry standards OAuth 2.0 and OpenID Connect for authentication, and OData v3 for user management via our Graph API. Web app, web API, mobile and PC app scenarios are fully supported. The same open source libraries that are used with Azure Active Directory can be used with B2C to accelerate development. If you want, you can get started right now! The rest of this post takes a look at how B2C works in detail. One quick note. The Microsoft button doesn’t work yet, but it will soon. It isn’t available at the start of the preview as we have more work to do in our converged programming model before we enable this. 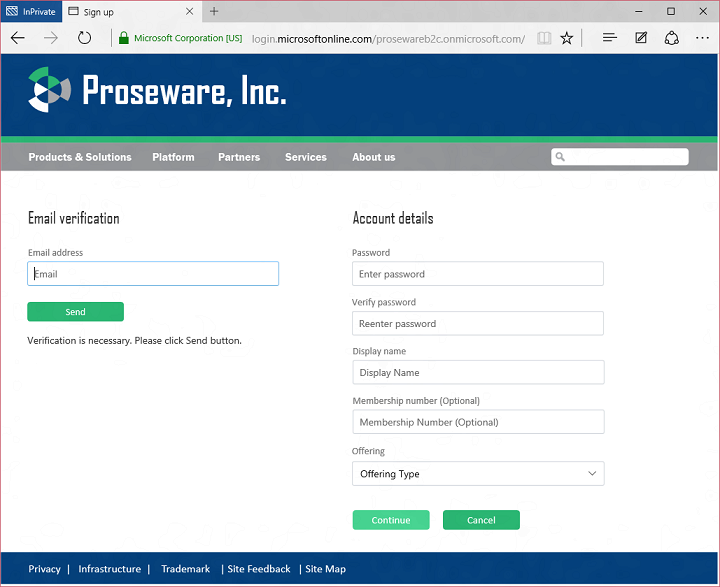 What’s a Proseware account? As it turns out, there are many people out there who don’t always want to use a social account to sign in. You probably have your own personal decision tree for when you use your Facebook, Google, Microsoft or other social account to sign in, or when you create an account specifically for a site or app. 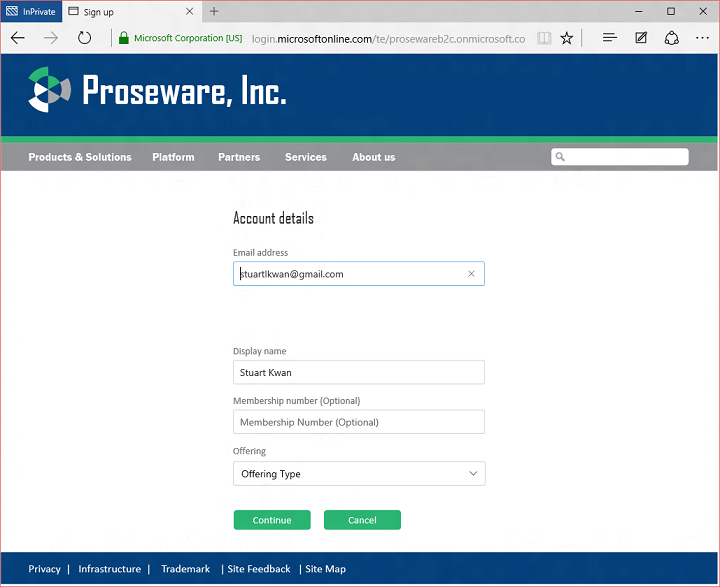 In B2C a Proseware account is what we call a local account. It’s an account that gets created in the B2C tenant using an email address or a flat string as a username, and a password that is stored in the tenant. It’s local because it only works with apps registered in your B2C tenant. It can’t be used to sign in to Office 365, for example. Here we can see the user is also asked to enter a Membership Number and Offering Type. These are custom attributes the Proseware developer has added to the schema of the B2C tenant. B2C takes care of verifying the person signing up has control of that email address before allowing them to proceed. 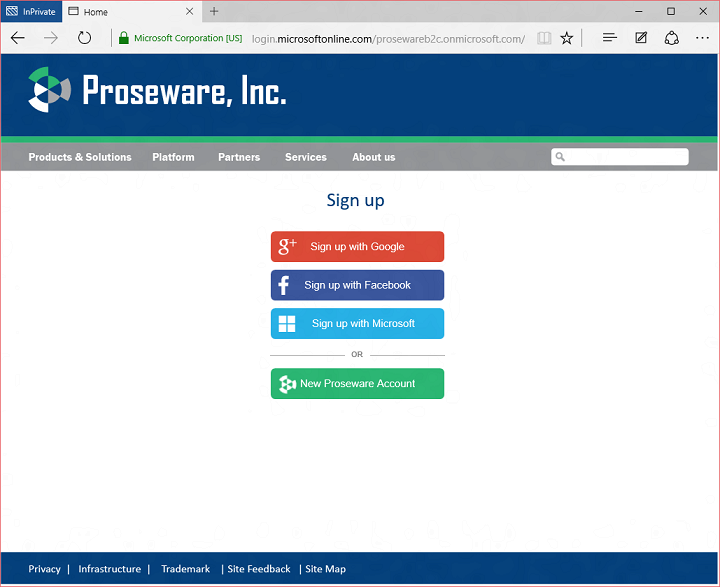 Voila, the user is signed up and signed in to Proseware! You might ask yourself, how much code did I need to write to make this elaborate sign up screen? Actually, almost none. 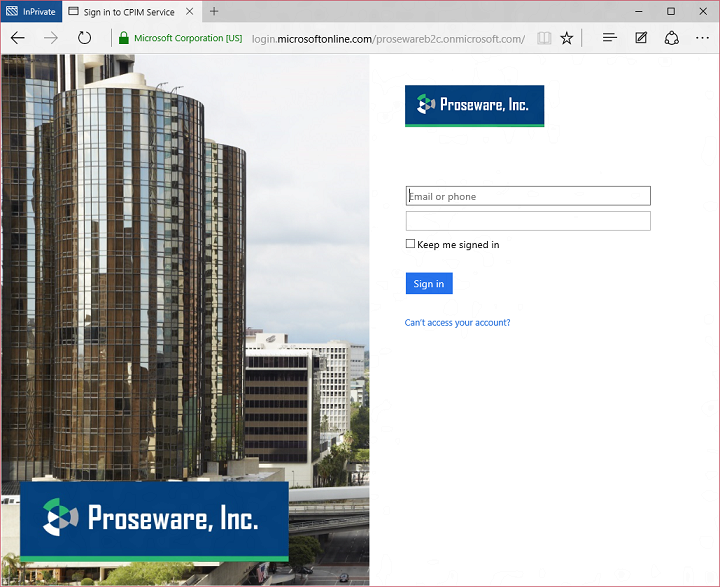 The sign up page is being rendered by Azure AD B2C, not by the Proseware application. I didn’t have to write any code at all for the logic on that page. I only had to write the HTML and CSS so the page rendered with a Proseware look and feel. The logic for verifying the user’s email address and everything else on the page is B2C code. All I had to do was send an OpenID Connect request to B2C requesting the user sign up flow. I’ll go into more detail on this later when I talk about how I wrote the app and configured the B2C tenant. If the user clicks one of the social network providers, B2C will direct the person to the provider to sign in. Upon their return B2C also picks up attributes stored in the directory and returns them to the app, signing the user in. That’s it! Now I’ll show you how I built this example. Step one was to get an Azure AD B2C tenant. 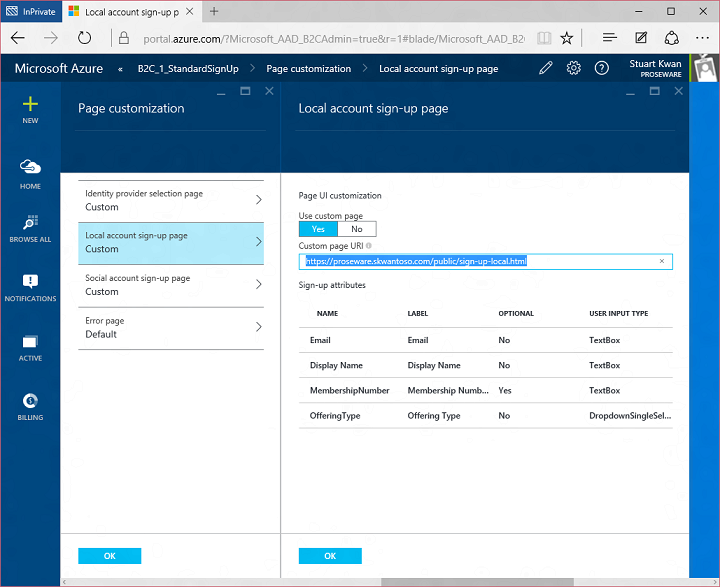 You can do this by going to the Azure AD section of the Azure management portal and creating a B2C tenant (for a shortcut, see the B2C getting started page). B2C tenants are a little different from regular Azure AD tenants. 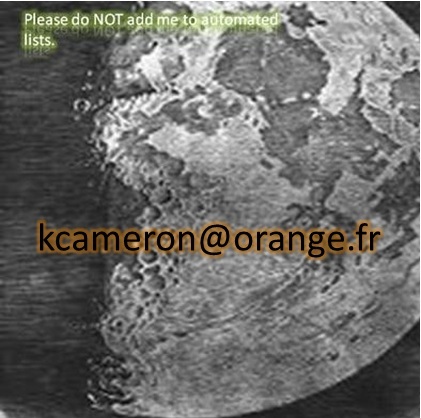 For example, in a regular tenant, by default users can see each other in the address book. That’s what you’d expect in a company or school – people can look each other up. In a B2C tenant, by default users cannot see each other in the address book. That’s what you’d expect – your consumer users shouldn’t be able to browse each other! I’m not using multifactor authentication in this example, but if I did it’s just a simple on/off switch. During sign up the user would be prompted to enter their phone number and we would verify it in that moment. You can probably imagine a number of different approaches for this kind of customization. We’re partial to this approach, as opposed to say an API-based approach, because it means our servers are responsible for correct handling of things like passwords, and our protection systems can gather the maximum signal from the client for anomaly detection. In an API-based approach, your app would need to gather and handle passwords, and some amount of valuable signal would be lost. That’s a quick look at how I set up a sign up policy. 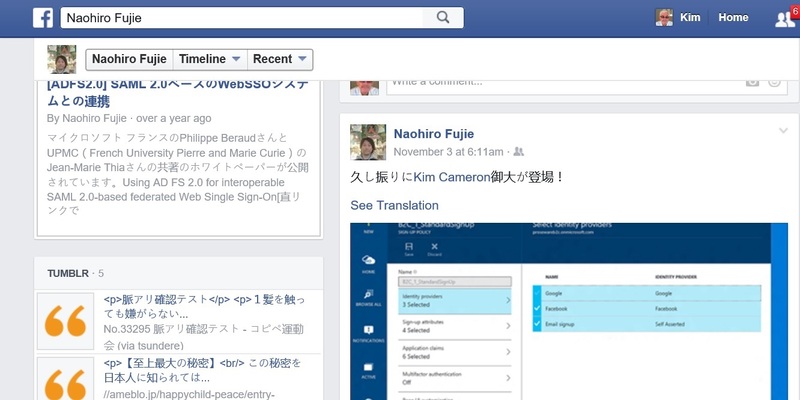 Configuring other policies like sign in and profile management is very similar. As I mentioned earlier, you can create as many policies as you want, so you can trigger different behaviors even within the same app. How to do that? By requesting a specific policy at runtime! Let’s look at the code. Here you can see the usual claims returned by Azure Active Directory and also a few more. The custom attributes I added to the directory and requested of the user during sign up are returned in the token as extension_MembershipNumber and extension_OfferingType. You can also see the name of the policy that generated this token in the acr claim. By the way, we are in the process of taking feedback on claim type names and aligning ourselves better with the standard claim types in the OpenID Connect 1.0 specification. You should expect things to change here during the preview. Since Azure AD B2C is in fact, Azure AD, it has the same programming model as Azure AD. Which means full support for web app, web API, mobile and PC app scenarios. Data in the directory is managed with the REST Graph API, so you can create, read, update, and delete objects the same way you can in a regular tenant. And this is super important – you can pick and choose what features and policies you want to use. If you want to build the user sign up process entirely yourself and manage users via the Graph API, you can absolutely do so. 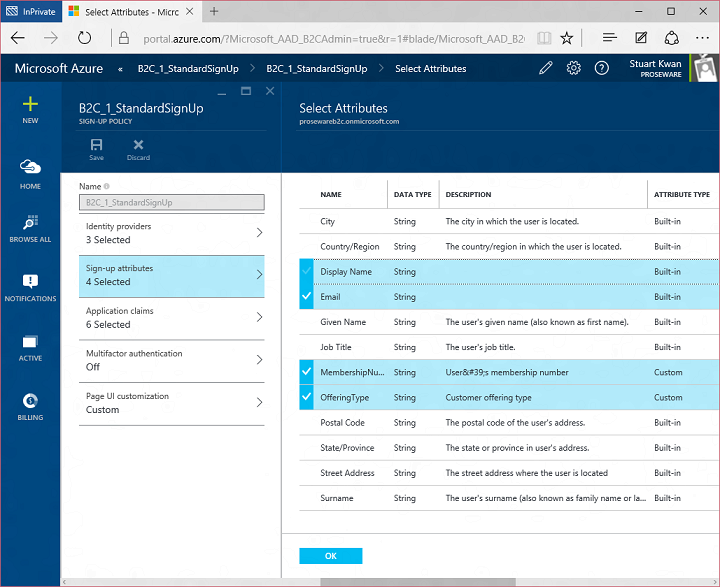 B2C conforms to Azure AD’s next generation app model, the v2 app model. To build your application you can make protocol calls directly, or you can use the latest Azure Active Directory libraries that support v2. 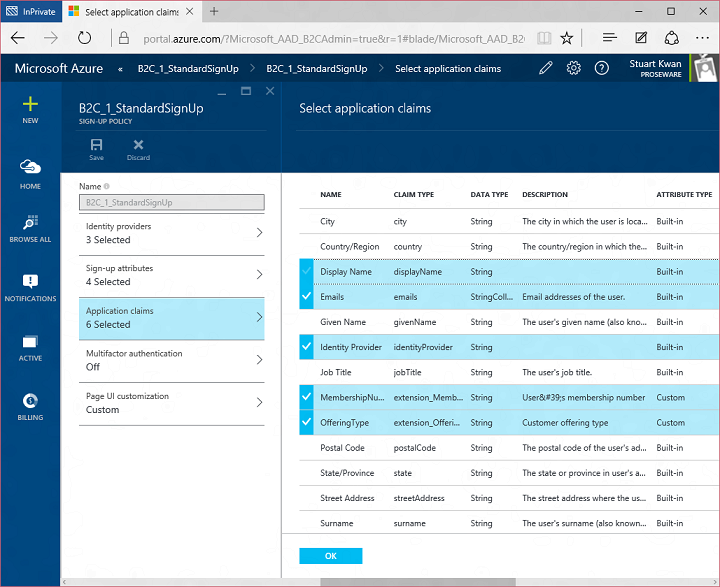 To find out more visit the B2C section of the Azure AD developer guide – we’ve got quickstart samples, libraries, and reference documentation waiting for you. 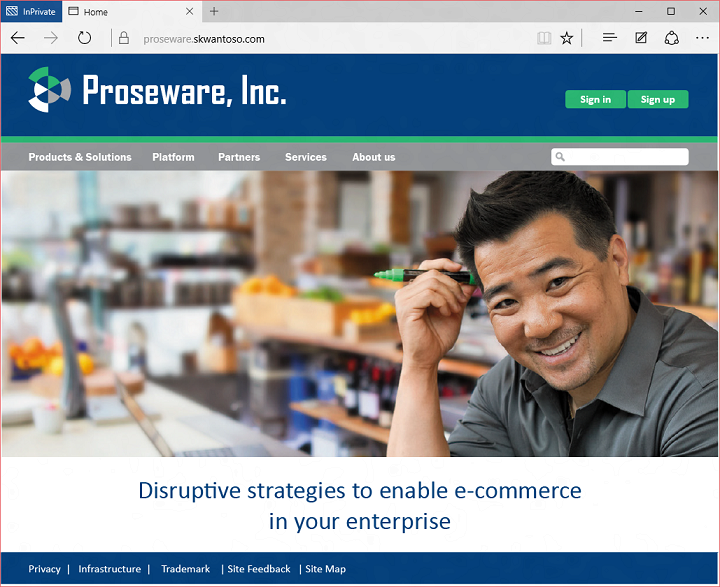 Just for fun, I built the Proseware example using Node.js on an Ubuntu Linux virtual machine running on Microsoft Azure (shout out to @brandwe for helping me with the code!). An authentication is defined as any time an application requests a token for a resource and successfully receives that token (we won’t charge for unsuccessful requests). When you consider the OAuth 2.0 protocol, this counts as when a user signs in with a local account or social account, and also when an application uses a refresh token to get a new access token. You can find the B2C pricing tiers on the Azure.com pricing page. There will be a free tier for developers who are experimenting with the service. The current B2C preview is free of charge and preview tenants are capped at 50,000 users. We can raise that cap for you on a case by case basis if you contact us. We’ll lift the cap when billing is turned on. Do you have hundreds of millions of users? No problem. Bring ’em on! Full UX customization: Not just the aforementioned HTML/CSS customization of the local account sign in page, but also the ability to have your URL appear in the browser for every page rendered by B2C. That will remove the last visible remnant of Microsoft from the UX. 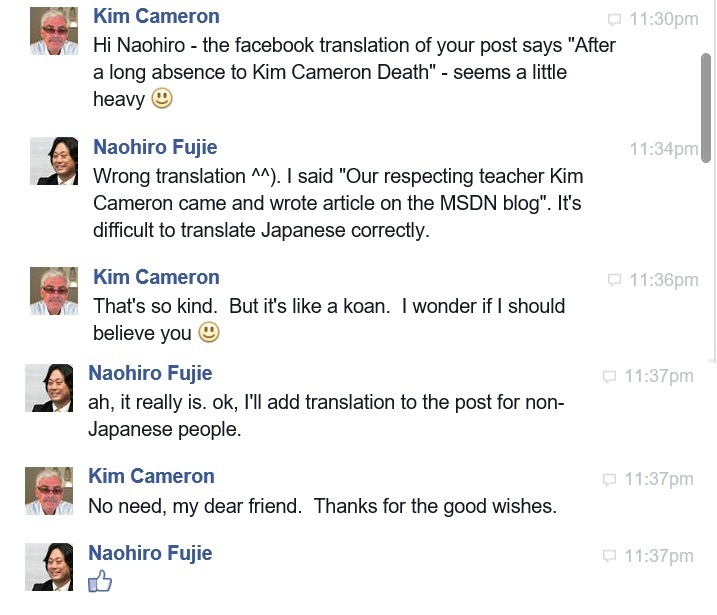 Localization: Of course you have users all over the world speaking many languages. Sign in, sign up, and other pages need to render appropriately using strings you provide in the languages you want to support. Token lifetime control: The ability to control the lifetimes of Access Tokens, ID Tokens and Refresh Tokens is important both for user experience and for you to tune your consumption rate. A hook at the end of sign up: A number of people have said they want the ability to check a user who is signing up against a record in a different system. A little hook at the end of sign up would allow them to do this, so we’re considering it. Support for more social networks. Support for custom identity providers: This would be the ability to, say, add an arbitrary SAML or OpenID Connect identity provider to the tenant. A variety of predefined reports: So that you can review the activity in your tenant at a glance and without having to write code to call an audit log API. You can track our progress by following the What’s New topic in the B2C section of the Azure AD developer guide, which you can find in the documentation pages and also by following this blog. By the way, the proper name of this preview is the Azure Active Directory B2C Basic preview. We’re planning a Premium offering as well, with features that take policies to the next level. But that’s for another blog post! We’re eager to hear your feedback! We monitor stackoverflow (tag: azure-active-directory) for development questions. If you have a feature suggestion, please post it in the Azure Active Directory User Voice site and put “AADB2C:” in the title of your suggestion. ZDNet’s John Fontana has written about the Webinar on Identity Management as a Service hosted last week by Craig Burton of Kuppinger Cole. The session began with a presentation by Craig on the revolutionary impact of the API economy in shaping the requirements for cloud identity. Then I spoke about the characteristics of Identity Management as a Service as they were shaping the industry and, especially Azure Active Directory, while Chuck Mortimer gave a good description of what we will be seeing in Salesforce.com’s emerging cloud directory service. The Webinar is available to those who want the details. If identity-management-as-a-service is to take hold among enterprises it will need to be anchored by well-crafted rules for establishing trust that incorporate legal parameters and policy requirements, according to a pair of identity experts. “Where we have seen trust frameworks be really successful in the past is where member organizations have some means and motivation for cooperation be that altruistic, economic, etc.,” said Chuck Mortimore, senior director of product management for identity and security at Salesforce.com. He cited the Shibboleth Project deployed in academia that highly incents universities to collaborate and cooperate. Trust frameworks ensure trust between those issuing an identity and the providers that accept that ID for authentication to access services or data, and in increasing cases, to tap application programming interfaces (APIs). To wit, 62% of the traffic on Salesforce.com is API calls, mobile clients and desktop clients. Mortimore and Cameron appeared together Tuesday on a Webinar hosted by Kuppinger Cole analyst Craig Burton. The identity-management-as-a-service (IdMaaS) concept is rising in importance due to an emerging “API economy,” according to Burton. That economy is characterized by billions of API calls to support services sharing data on a massive, distributed scale that stretches across the enterprise and the cloud. IdMaaS defines a cloud service that manages identity for an organization’s employees, partners and customers and connects them to applications, devices and data either in the enterprise or the cloud. Cameron said the only way all the requirements can be met is with an identity service that fosters simplification and lower costs. And the only way that gets off the ground is through the use of trust frameworks that simplify the legal and policy requirements. Cameron pointed to a number of current trust frameworks certification programs including Kantara and the Open Identity Exchange. Mortimore said end-users need to start with a “baseline of security and trust” and go from there. He said he believes most enterprises will use a hybrid identity management configuration – enterprise infrastructure plus cloud. Mortimore said cloud identity management services represent a nice transition path. Salesforce.com backed up that idea last month when it introduced Salesforce Identity, a service baked into its applications, platform, and development environment. Mortimore ran the list of features: a directory that anchors identity management, reliance on standard schemas and wire protocols, extensibility and programmability. “We are not running this as a Salesforce identity service, we are running it on behalf of customers. That is a critical part of these identity cloud systems. We need to facilitate the secure exchange of identities, federation, collaboration and attribute exchange,” said Mortimore. Microsoft’s service is called Azure Active Directory, and it offers the cloud-based services in a similar fashion to what Active Directory and other Microsoft infrastructure products (authentication, federation, synchronization) do within the enterprise. “You need to use the efficiencies of the cloud to enable new functions in identity and provide more capability for less money,” he said. While they are giants, Microsoft and Salesforce.com represent just a handful of providers that offer or are building cloud identity services. 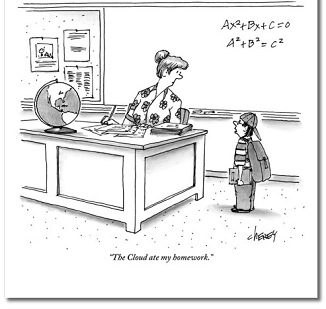 (Disclaimer: My employer offers a cloud identity service). In mid-August I got an email athat made me do a real double-take. The subject line read: Legacy Service End of Life – Action Required. Of course I spend a lot of my time thinking about the cloud: people who’ve heard me speak recently know that I’ve increasingly become a zealot about the new capabilities it opens up, the API economy and all that.. So I suppose that getting a pail of cold salt water thrown in my face by joyent was probably a good thing! Imagine telling customers their infrastructure will be shut down within three months in an “action required” email! We understand this might be an inconvenience for you. We want you to take the time you need to focus on your personal safety, so we are extending the migration deadline from October 31, 2012 to the end of day Wednesday, November 7, 2012. By the way, don’t think I was using a free service or an unreasonably priced plan. I had been on a joyent “dedicated accelerator” for many years with an upgraded support plan – on which I only ever made a single call. This site was the very one that was breached due to a wordpress cross-site scipting bug as described here [note that my view of Joyent as a professional outfit has completely changed in light of the 2 month fork-lift ultimatum they have sent our way]. Anyway, to make a long and illuminating story short, I’ve decided to leave joyent in the dust and move towards something more professionally run. Joyent served up what has to be one of the nightmare cloud scenarios – the kind that can only give the cloud a bad name. Note to self: Read fine print on service end-of-lfe. Tell customers to do same. Meanwhile, I’ve taken advantage of the platform change to move to the latest version of wordpress. This meant paying the price for all the modifications to wordpress I had made over the years to experiment with InfoCards, OpenID, U-Prove, SAML, WS-Trust and the like on a non-Microsoft platform. So friends, please bear with me while I get through this – with a major goal of keeping all the history of the site intact. There are still “major kinks” I’m working out – including dealing with the picture in the theme, re-enabling comments and porting the old category system to the new wordpress mechanisms [categories now work – Kim]. None the less if you see things that remain broken please email me or contact me by twitter or linkedin. OK – I now “throw the big DNS switch in the sky” and take you over to the new version of Identityblog.